Corn Ice Cream. Ice cream made with corn. On the cob. That is what went through my head when I started seeing all of these corn recipes in my cooking magazines. I’m a fan of the unusual but this is one I wouldn’t have thought of on my own. I hemmed and hawed for quite some time before finally deciding to make this. I even started to talk myself out of it, assuming that I would be the only one to eat it and since I’m on a huge calorie-counting exercise every morning (5 days in a row, thank you very much!) kick, I didn’t want to be stuck with 4 cups of ice cream, even if it was only 237 calories per half cup. Because really, who eats ice cream in half cup servings? Oh, you do? Well more power to you then. I’m not one of those people. So I decided to cut this recipe in half. 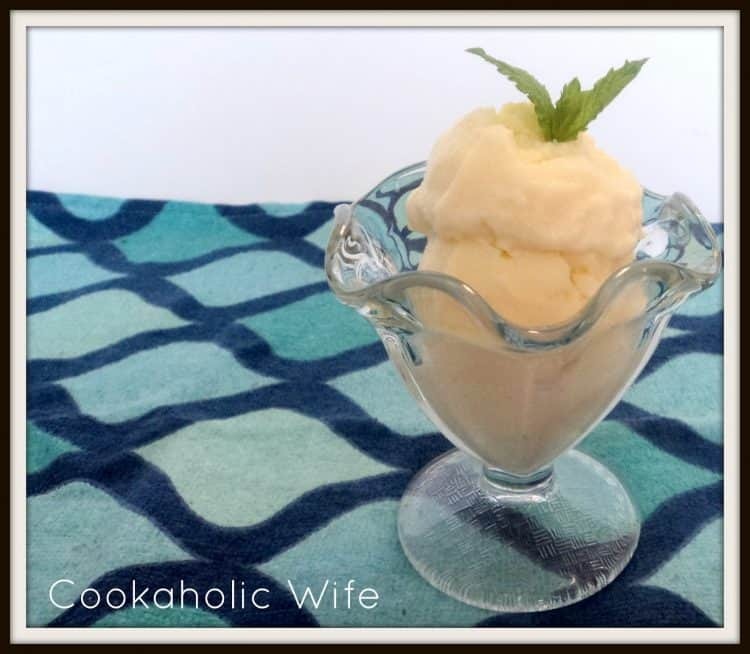 An unlikely choice, but using fresh sweet corn makes for one delicious homemade ice cream. Cut corn kernels from the cob. Place the corn kernels and 3/4 cup of milk into a blender and puree until smooth. 2. Transfer the mixture to a large saucepan. Add the remaining 3/4 cup of milk, sugar, salt and corn cobs. Heat the mixture over medium-high heat until it reaches 180 degrees and small bubbles form around the edges. Do NOT boil. 3. Remove from the heat. Let sit for one hour. Discard the corn cobs. 4. Heat the saucepan again over medium-high heat until it reaches 180 degrees. Meanwhile, whisk the egg yolks into the half-and-half. Slowly pour the half-and-half mixture into the saucepan, stirring constantly with a whisk. 5. Slowly pour the rest of the half-and-half mixture into the saucepan until it reaches 160 degrees, about 2 minutes, stirring constantly. 6. Place a mesh sieve over a container with a lid. Pour the mixture through, pressing with a spoon and discarding any solids. Place the lid over the container and refrigerate for at least 4 hours, but up to overnight. 7. Transfer the mixture to your ice cream maker and process according to directions. Recipe time does not include time for cooling or processing in ice cream machine. It didn’t matter though, because this ice cream is absolutely delicious! I wasn’t sure what to expect using a vegetable in ice cream but it’s so good. You totally need to try it! What a FUN, unique recipe. I can't wait to try this. Thanks for linking in to my round-up this month.